What’s better than heading to your farmer’s market on a beautiful crisp morning and enjoying a delicious cup of hot apple cider? I know…these donuts. I have recently come back from the Hamptons where I enjoyed hot fresh apple cider donuts at a beautiful farm market called Milk Pail, which inspired me to make a healthier version. Apple cider is available almost everywhere so now is the time to take advantage and make these donuts. I recommend dipping your donut in a hot cup of apple cider to really live it up. Donut baking pan. I used a large 3 1/2" cavity- 9 donut silicone pan. Preheat the oven to 350°F. Grease the donut pan with melted coconut oil, ghee, or grass-fed butter. Place the apple cider in a small pot and bring to a simmer. Reduce to 1/4 cup, about 15-20 mins. Set aside to cool. Whisk together all of the dry ingredients. In another bowl whisk the egg yolks, yogurt, maple syrup, coconut oil, and reduced apple cider. Whisk the dry ingredients into the wet until combined. Using an electric mixer, beat the egg whites to form stiff peaks. Gently fold into the donut batter until combined. Divide the batter into the donut cavities, about 1/4 cup of mixture. Smooth the tops and bake for 15-20 minutes or until lightly golden. Allow to cool in pan for 10 minutes before flipping the pan to release donuts. While donuts are in pan cooling, make the topping. Combine the cinnamon and sugar in a large bowl. 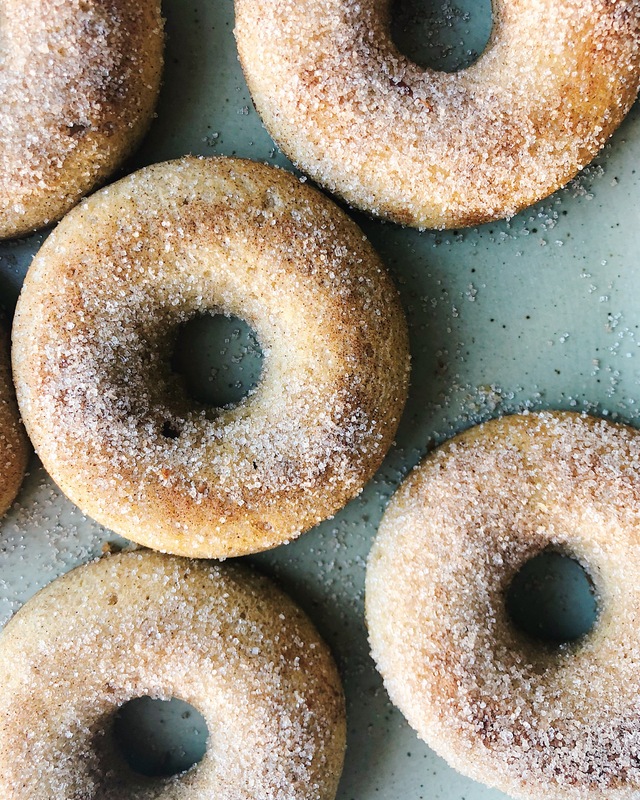 While donuts are still warm, toss them in the cinnamon sugar. Place finished donuts on baking rack to cool completely or enjoy warm! This entry was posted in Dessert and tagged apple cider, apples, Autumn, fall, farmers market, grain-free, hamptons, healthy baking, local, organic, pastured eggs. Bookmark the permalink.